The piece below was written by Autographs Specialist Marco Tomaschett. Autograph collectors all encounter it at one time or another: the perfectly illegible autograph. The impossible convulsive scrawl of Giacomo Puccini, or the idiosyncratic tremor of the Duke of Wellington—interpreting autographs like these is almost always frustrating, but they are especially so in more informal letters. One wonders how the recipients of such letters could understand them at all! Surprisingly, the recipients could often read even the hastiest lines with little trouble, because they were familiar with the orthographic style of the writer and the conventions among writers in those places and times. 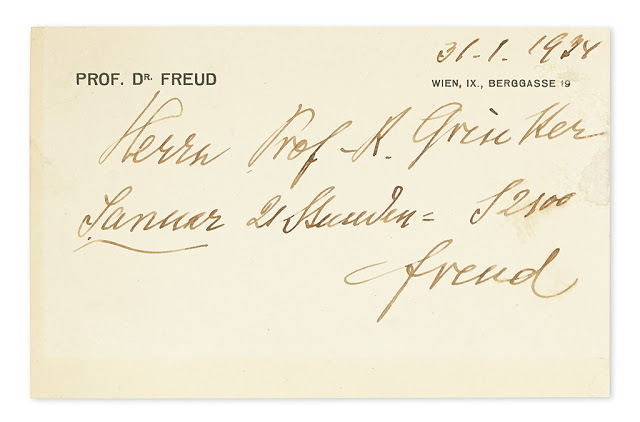 Lot 65: Sigmund Freud, Autograph Note Signed, a bill for one of his last patients, Vienna, 31 January 1934. Estimate $3,000 to $4,000. In Vienna during the 19th century, the script that was taught in schools was quite different from that in the non-German speaking parts of the world, and different as well from the German script of the present-day. This style of script is known as Kurrentschrift, and it was used in the same way that (some of us) use cursive today. Sigmund Freud, for instance, wrote letters, scribbled analyst’s notes and signed his name, in Kurrentschrift. An example of his characteristic signature can be seen in lots 65 and 66 of Swann’s 22 October autographs auction. Although Freud is known to have signed his name in other ways, he often signed “freud.” The capital and lowercase “F” of Kurrentschrift are very similar in form, but not identical. 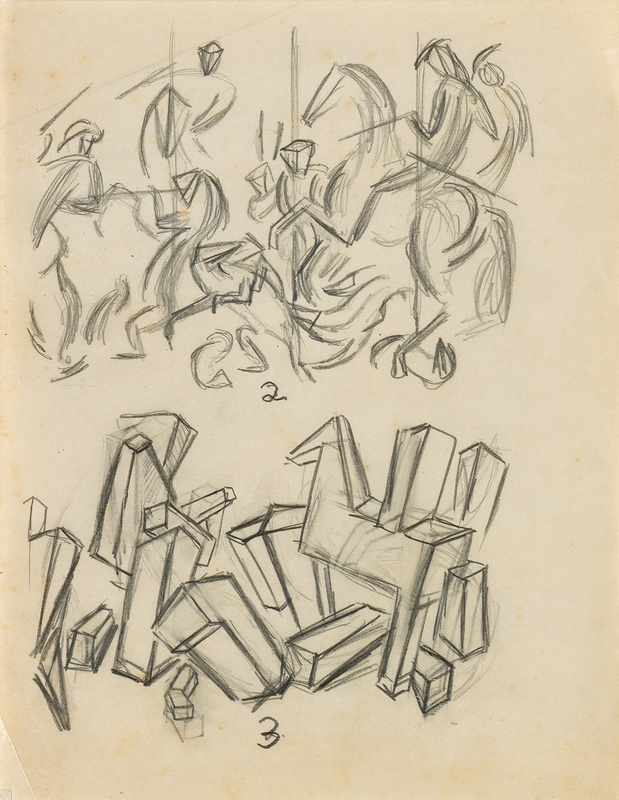 Freud wrote these two letterforms identically, not only in his name, but universally. Despite this slight stylistic liberty, recipients of Freud’s letters would undoubtedly have recognized that “first National Bank” and “freud” were intended to be understood as capitalized. 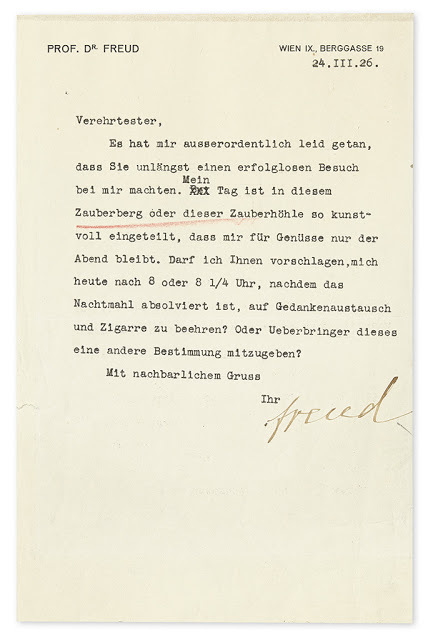 Lot 66: Sigmund Freud, Typed Letter Signed “freud,” Vienna, 24 March 1926. Estimate $2,000 to $3,000. 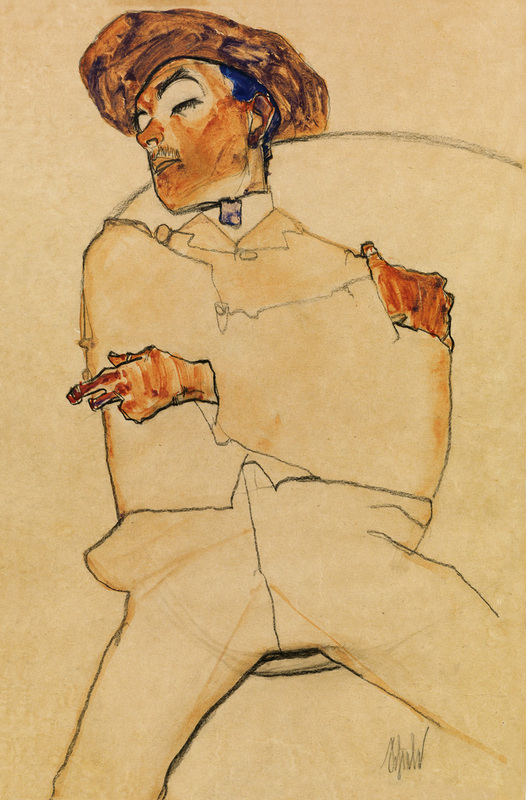 The painter Egon Schiele, living at roughly the same time and place as Freud, also wrote in Kurrentschrift. No amount of familiarity with Schiele’s peculiarities would have rendered understandable the printer’s error in the catalogue for his 1916 Kunstschau exhibition. In that catalogue, illustrations of two of his works were either ascribed to a different painter, or titled inaccurately. In some copies of this catalogue, including the one on offer in lot 384 of Swann’s October auction, Schiele marked through the erroneous print and wrote the correct information below. 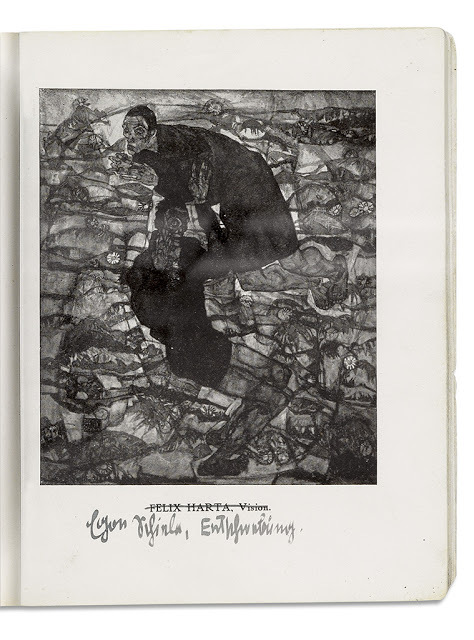 Lot 384: Katalog der Wiener Kunstschau signed and inscribed by Egon Schiele, 1916. Estimate $6,000 to $9,000. While Freud intended his name to be capitalized and was somewhat indifferent as to how it was written, e.e. cummings was famously insistent that his name be printed entirely in lowercase letters. 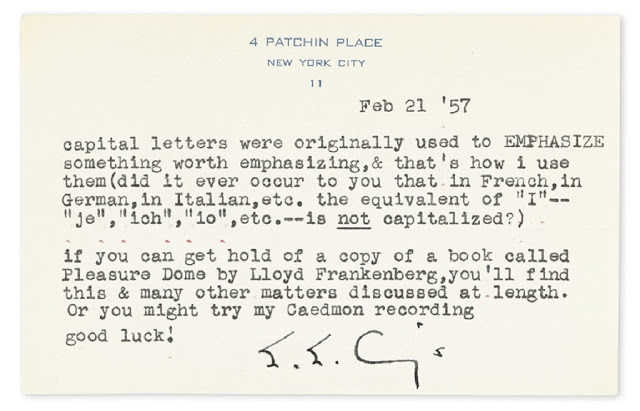 As he explained in the letter contained in lot 318 of Swann’s October auction, cummings conceived of the capitalization of words referring to himself the same way that European languages used capitalization of first-person pronouns: written in lowercase, unless capitals were needed to convey emphasis. Paradoxically, cummings signed the letter in lot 318 with capital letters—perhaps for emphasis! Lot 318:e.e. cummings, Typed Note Signed “E.E. Cg’s,” on the choice to utilize lowercase letters for his name, New York, 21 February 1957. Estimate $800 to $1,200. 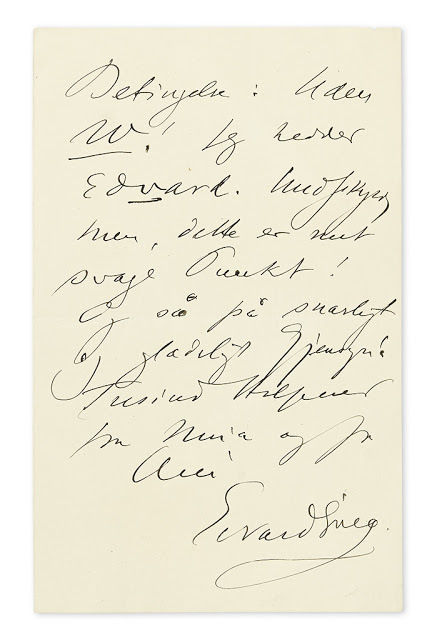 Lot 254: Edvard Grieg, Autograph Letter Signed, correcting a common misspelling of his name, Bergen, 22 September. Estimate $1,000 to $1,500. 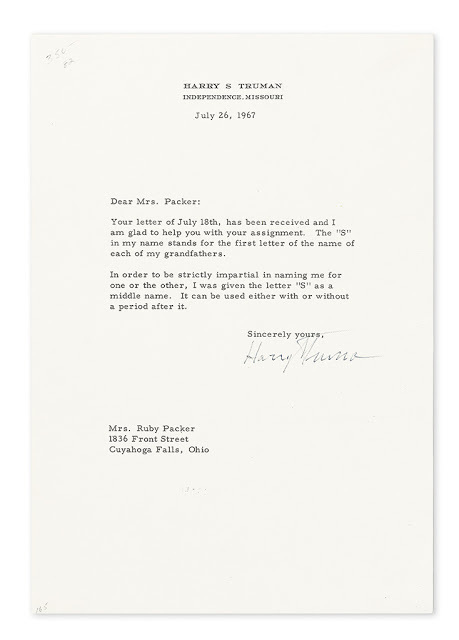 Lot 217: Harry S. Truman, Typed Letter Signed, explaining his middle name, Independence, 26 July, 1967. Estimate $500 to $750. Perhaps the most remarkable orthographic autograph in Swann’s October auction is Noah Webster’s letter (lot 362) to a group of conservative editors, in which he touches upon his justification for the spelling reforms introduced in his American Dictionary, 1828. He states that his reforms are not innovations, rather corrections: “The ignorance or negligence which introduced wrong spelling, &, in some cases, made words which are nonsense, & then permitted these words to occupy a place in our best books, even in the Bible, for centuries; appeared to me an abuse of the language not to be tolerated.” Webster signed his letter “N Webster,” and though he just as often signed his full name, he did not tolerate alternative spellings of his name. 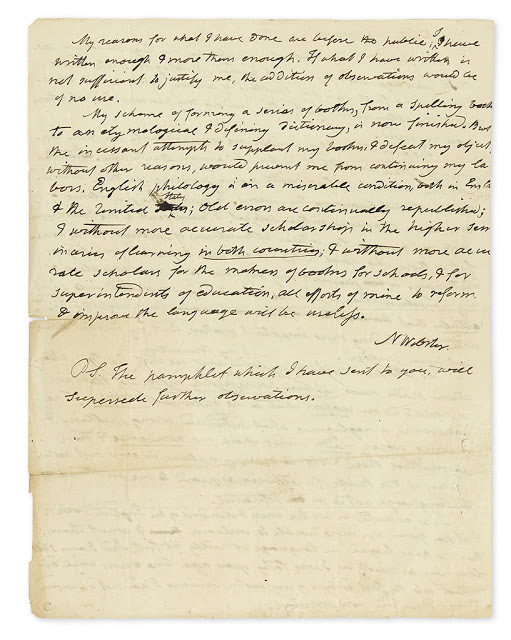 Lot 362: Noah Webster, Autograph Letter Signed “N Webster,” directing unnamed editors to sources justifying his spelling reforms. William Shakespeare, who was writing long after the Bible was written and long before Webster was born, signed his last name “Shakspere,” or “Shaksper,” or in other ways; but his tolerance for spelling variation was not uncommon, and it extended to not only personal names, but to the written language generally. Despite the lack of standardized spelling, probably all who knew him would understand just who was meant when encountering any of the various instances of Shakespeare’s name, and it would seem surprising if the number of any sort of misunderstanding among writers was greater in his day than today. Nevertheless, it is likely that writers will never cease to labour to give each thing its true name. Or rather I should say labor. More information on these items and additional autographs can be found in our catalogue.